Major Pam Waugh, Head of Social Services, Salvation Army. 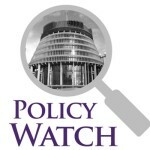 Welcome to the latest Policy Watch e-letter highlighting the latest news, research and policy developments relevant to the NZCCSS mission to work for a just and compassionate society in Aotearoa New Zealand. Election 2017 now seems an age away as we adjust to the 52nd New Zealand Parliament. What this new political configuration will means to local communities and services will take time to understand and to work through. Meanwhile, it’s all go at Parliament with Ministerial portfolios assigned, select committee membership confirmed, and a legislative schedule reinstated. All sitting alongside the government’s pre-election 100 day plan. The Advent season is also here and preparations to put Christ in Christmas for thousands of families across the country have already begun. Behind the scenes, this means lots of work and planning up and down the country in local church communities and in their associated social services. Thousands of staff and volunteers are involved in all this good work, fund raising, collecting toys and food items, and other necessities to support families to celebrate this special day. Our members tell us the story of basic needs unmet remains unchanged for another year and some of our social services are predicting even greater need this year. The Salvation Army reports this Christmas more than 17,000 families in crisis are expected to seek help for food support, budgeting, counselling, education and accommodation assistance. Let’s re-imagine a time when there is zero tolerance for poverty and basic necessities are accessible to all families. A strong and enduring response to reducing poverty – While the community sector awaits the detail on how the government’s vision of reduced child poverty will be achieved, NZCCSS, along with a broad range of children’s advocacy groups, have released a statement supporting the Children’s Commissioner’s call for bold action for child poverty reduction and a cross-party consensus, along with his offer to broker a broad, multi-party accord for child poverty reduction. New Research on harm from Oranga Tamariki – A broader definition of harm, based on a “zero tolerance” approach, has been applied in a new research report released by Oranga Tamariki. The report found 85 out of a representative sample of 698 children/young people in state care between 1 July 2015 and June 2016 experienced harm. Although limitations were identified in the research, the findings add another layer to the agencies understanding of the scale of harm experienced by children in state care. Listen to Chief Executive Grainne Moss talk to Kathryn Ryan about the report on Radio NZ. GETTING IT RIGHT : The Children’s Convention in Aotearoa – The Office of the Children’ s Commissioner has released a very readable 8 page document which summaries the Childrens Convention Monitoring Group (UMG). It’s an informative document which provides a 101 on the UN Convention of the Rights of the Child. Great work! Workforce Survey – This survey will help inform the development of a workforce report being prepared by Social Service Providers Aotearoa (SSPA) for Careerforce, the Industry Training Organisation covering social services, community, disability and health. The report will also inform workforce development plans for both SSPA and Careerforce. The survey takes approximately twenty minutes to complete and closes at 5pm on Friday 8 December 2017. All participants will go in the draw to win a workplace morning tea shout. Health Minister Commits to Reducing Health Inequality – New Health Minister Hon Dr David Clark has named the impacts of inequality as central to his work as Health Minister in one of his first speeches as Minister. Referring to a 2014 OECD study he said it “showed New Zealand has had the fastest growth in inequalities of any Western country in recent decades. We should not be a world leader in inequalities. It’s something that we need to change, together. We see inequality every day in our health system…” His speech emphasised his government’s commitment to strengthening the public health system, access to primary care and secondary care and a ministerial inquiry into mental health, giving some signals of where his focus will be. The Health Minister’s speech is timely in light of new health research undertaken by Dr Helen Francis, Massey University, who studies people with long-term health conditions over 18 months. Dr Francis found a significant number of patients with complex and chaotic lives, where the dominant self-management approach was simply not effective. “One woman in my study was really, really sick but she was also a caregiver for her brother, who was far more more il than she was. She couldn’t look after her health because her priority was looking after her brother“. No short sharp fix for stigma – The new Social Development Minister, Carmel Sepuloni is also looking to make changes to the way people receiving benefits are viewed by the public. “It concerns me that there still is that stigma or perception because we want to build people up, not kick them and tear them down.” There is recognition though that these complex issues don’t have quick fixes but a change of language is certainly a good start. Social Workers Registration Legislation Bill – This bill seeks to mandate the registration of social workers and the title “social worker”. While mandatory registration is broadly supported across the profession, there has already been strong concern raised that the bill focuses too strongly on what social workers are called rather than on what tasks they do. Under this bill, it is the employer who determines whether a job has the title social worker and therefore subject to registration and Annual Practicing certificate. The Bill has been referred to the Social Services and Community Committee and submissions close on 31 January 2018. NZCCSS will be undertaking robust consultation with member agencies on this bill and will update members. Healthy Homes Guarantee Bill (No 2) – This Bill passed its final reading in Parliament on 30th November and passes into law. It gives the Government power to set standards for rental housing quality that will cover heating, insulation, ventilation, draught stopping, drainage and moisture. Minister Phil Twyford says, “Many landlords will already meet these standards and will not have to change anything. For those that need to upgrade their properties, government grants for installing heating and insulation will be available.” There will also be a consultation process over the next 18 months to ensure that tenants, landlords, public health and building science experts and industry representatives have an opportunity to get involved in creating robust minimum standards. Parental Leave and Employment Protection Amendment Bill – Minister for Workplace Relations and Safety, Iain Lees-Galloway’s Bill also passed into law on 30 November. it extends paid parental leave to 26 weeks by 2020 and is part of the Government’s Families Package that is intended to help reduce poverty and provide better support for New Zealand families. Transform18: Transform18 is a conference focused on empowering the local church to see community transformation through social change initiatives. Drawing from the Glen Eden Baptist story, Transform18 will share the lessons and insights that helped a local church with a passion to care for the most vulnerable and those on the margins, grow a community organisation that reaches over 20,000 individuals and whanau each year.The conference will bring together national voices of community change including Bishop Justin Duckworth, Lisa Woolley, Major Campbell Roberts and Gary Grut, and also provide the practical knowledge and experience for churches wanting to build or grow community trusts for the transformation of their communities. In memory of the $1 that started VisionWest, the cost of this conference will be $1 per delegate. Donations will be taken up across the two days to cover conference costs. Don’t miss this one!